The Run Free Bio from Soul Electronics is a set of smart sports headphones that wants to help runners become better runners. Unveiled back in January at CES and now available to buy in the US for $149.99 with a launch outside of the US slated for later in 2018, these wireless in-ears include innovative tech that's capable of delivering the same kind of gait analysis you’d normally have to go to a specialist running store for. That hit of biomechanics data is used to provide real-time coaching to fix bad running form and reduce the chances of picking up an injury. 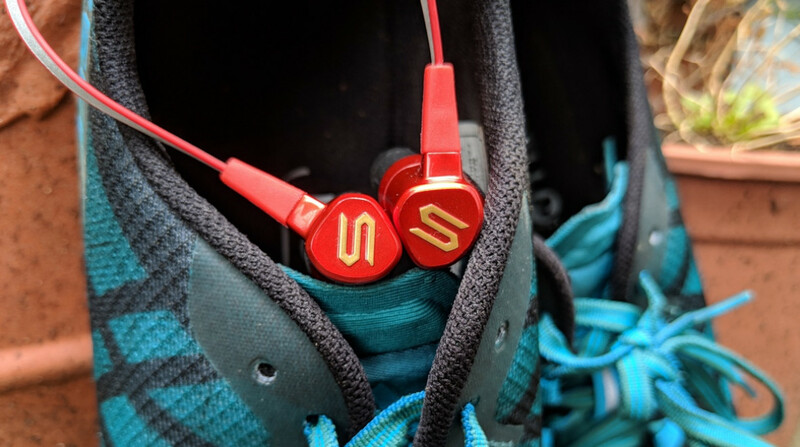 I’ve been fortunate enough to get a pair to try out, and squeezed in a couple of runs with them to find out just how well the coaching skills work and whether they do those sports headphones basics well too. Before I get into those coaching skills I want to talk about what they’re like to wear. Design-wise, they don’t stray too far away from the look of your average sporty in-ear headphones. They’re available in red or grey, there's a built-in remote for music and call control with a small compartment hiding away the microUSB charging port. A flattened cable holds everything together with a small clip to tighten the fit when they’re lying on the back of your neck. The earbud casing looks a bit on the large side, which is down to the need to house the biomechanics-collecting tech. The sweat proof in-ears include replaceable ear tips and ear hooks to give you the most comfortable fit, and it definitely pays off to play around and find the ones that work best for you. Once I did settle on the right combo, any concerns with the bulky look buds quickly dissipated. The tips sit snug inside the ears and remained secure during my first run out with them. There are a couple of extras I really like that will appeal to nighttime runners too. The cable is reflective to aid visibility and there’s an LED safety light in the bottom of the battery that’s built into the cable. It’s switched on as default, but you can switch it off from the companion app when you're running during the day. On the sound quality front thankfully they don’t fall into the category of sports headphones that put an emphasis on bass, sacrificing clarity and detail in the process. They don’t roar with power, but they’re definitely not on the quiet side either. It’s a nice balance and it was overall a solid listening experience with decent isolation and no signs of leaking. There’s no in-app equaliser to tinker with the sound profile, but most people are going to be satisfied with what these muster up out of the box. So let’s get into that gait analysis tech. Soul Electronics has teamed up with a company called Beflex Inc which claims that its chip tech is able to extract accurate running form data based on head motion. The BiomechEngine can collect data on cadence, head angle, vertical oscillation, step width, symmetry and shock. This information is then used to offer more advanced running metrics to review post run in the app. It can also be used during a run to recognise when there are issues in your technique, offer fixes and let you know when they’ve been addressed in real time. To get that coaching hit you’ll need to download the Soul Fit smartphone app, which is available for both iOS and Android. I downloaded both apps and they’re near identical as far as layout and features go. There are two connections you need to make: the first is to connect the headphone as an audio device to play your music. The second is to connect to the Biotech engine to track your run. The latter though needs to be done from within the app. When you’re ready to run, it’s a simple case of going back to the app's home screen, selecting whether you want to track indoors or outdoors and then hitting play. There's no GPS sensor built into these headphones, so you'll need your phone with you to track routes and to experience the real-time coaching. As I mentioned I’ve only had a couple of runs with them, but early signs suggest there’s a lot to like about the Pro Bio headphones. My experience wasn't free from niggles, but on the whole Soul Electronics could have something quite impressive on its hands. As I started my run, the first feedback I received focused on my feet symmetry, pointing out that my right foot was weak. I'm a leftie and I know I always put more emphasis on my left side, so it wasn't all surprising to hear that. The robotic-sounding coach told me to pay closer attention to how my right foot was landing in comparison to my left. A few seconds later, the coach told me I had addressed the issue. When I switched from road to trails and I was 5-6 miles more into my run, I was now being alerted to the fact that I was hitting the the floor too hard with my foot and was asked to soften that foot strike. It’s similar to feedback I’ve received using the Lumo Run so it was definitely an aspect of my technique that I know I can encounter issues with. The part of my gait I had the most consistent feedback about on my run was my head angle, which is related to posture, specifically the upper body. On numerous occasions I was told that my head was too high or too low and that I needed to raise it and look forward. I seemed to address it on most occasions, but near the end of a run the feedback to fix it came at an irritating rate. Despite feeling like I had addressed it, I wasn't 100 per cent happy that the angle it said was okay was actually okay. Analysing upper body posture is important but it felt like the inability to analyse posture further down was a problem. On the whole though, I found the coaching useful and surprisingly insightful. It was nice to hear when I was on top of my running form, but also good to be told when my technique was dropping and to get advice on what I needed to do to correct it. I should mention one issue I did have during that first test run and that was when the headphones disconnected from my iPhone. When I returned to the app I was able to simply reconnect, but it meant that I had to restart the session. Thankfully the session I had completed was saved. Heading back to the Soul Fit app and under the History tab I can see my logged runs. Along with a map of the route, I can review standard information like distance, pace, speed, time, splits, active time and running time. There’s also further data on altitude and cadence, which served up the same 175spm that my Garmin Forerunner 935 paired to the Running Dynamics Pod recorded. There are also dedicated screens for running form covering head angle, step width, step length and vertical oscillation. There’s a lot of data here, but what I like is that you can expand this to get a better understanding of what the running data means and what you can do to make improvements. But there’s more. You also get data related to injury risk with information related to leg stiffness, shock, max force, symmetry and consistency. I’d need to register a fair few more runs to see how reliable this data is, but there's definitely plenty of data here and thankfully there's an effort to help runners make sense of it. While a lot of sports headphone companies have taken the route of smartening up their tech with heart rate monitors and fitness trackers, maybe coaching is actually the way to go. I have to admit that my expectations were low with the Run Free Pro Bio, but what I've found so far is a really well designed pair of in-ear headphones that tick off those basics, but also brings something really innovative to the party. I haven't been this impressed by a real-time coaching running wearable since the Lumo Run. The Run Free Bio has something going for it that the Lumo Run doesn't though, and that's building its coaching powers into headphones, something I and no doubt a lot of people will always run with. It'll take a fair few more runs to really know if those coaching insights are making a difference, but it looks like the folks at Soul Electronics could be on to something here.